About a year ago, I was experiencing forced time off from work due to the government shutdown. It was a time of annoying uncertainty, but also decadent mid-day naps with my fluffy dog and impromptu visits with my fellow unemployed friends. One of my genius friends hosted a midweek furlough/unemployed/underemployed cookout. Why? Because you can’t do that when you’re working! The host asked me to make a special furlough ice cream for dessert. I went for a patriotism theme with apple pie. In honor of the occasion, I called it “Furlough Caramel Apple Pie Ice Cream.” It helped drown my temporary unemployment sorrows. This year, I can just enjoy the ice cream to celebrate my favorite season without worrying about when I’ll get my next pay check. I realize I’ve named this flavor “Caramel Apple Pie Served with Ice Cream” ice cream. That’s purposeful. The spiced apple mix in this recipe was inspired by the Spiced Apple Ice Cream in Spice Dreams: Flavored Ice Creams and Other Frozen Treats by Sara Engram and Katie Luber. They mix the spiced apples into their vanilla ice cream, for a uniform spiced apple flavor. I wanted to replicate apple pie à la mode in a scoop, so I layered vanilla ice cream with pockets of caramel sauce, spiced apples, and pie crust. 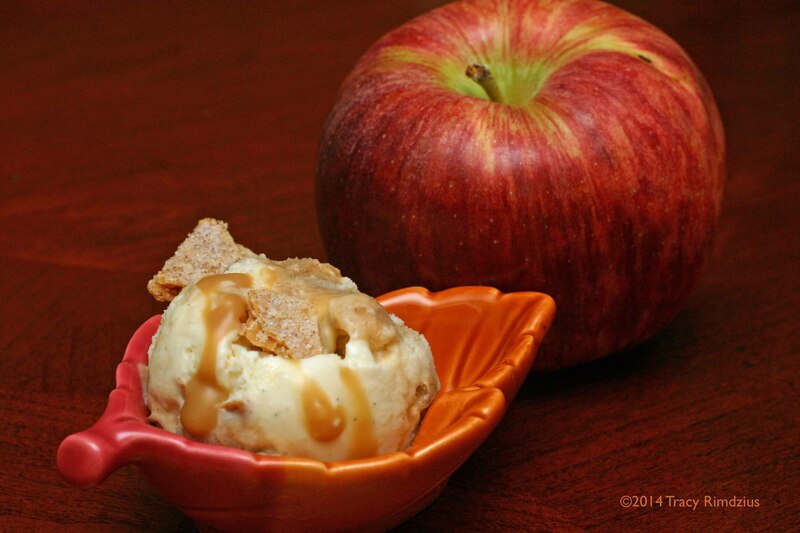 To minimize the extent to which the apples freeze in the ice cream, surround the apple layers with caramel sauce. The caramel sauce recipe I use is here. Use the ice cream recipe below, your own favorite vanilla ice cream recipe, or even store-bought vanilla if you’re short on time. I usually use only one egg yolk in my vanilla, but doubled that for this recipe to make it more rich. For the ice cream: In a small bowl, whisk 1 oz. milk into the cornstarch with a fork until smooth. Place a fine-mesh strainer over a large bowl containing a pinch of salt. Measure the sugar into a medium bowl. Measure remaining dairy ingredients, corn syrup, and most of the pre-measured sugar into a 4-quart or larger pot. Split the vanilla bean, scrape out the seeds, and add the bean and seeds to the dairy mixture. Bring the dairy mixture to a boil over medium-high heat, stirring to avoid scorching. Remove pot from heat and gradually whisk in the cornstarch slurry. Bring dairy mixture back to a boil, stirring with a spatula for about one minute or until the mix slightly thickens (when the slurry has done its job, the mix will coat the spatula rather than run off immediately). Remove pot from heat and let mixture cool until is it 175 degrees (about 5 minutes). While waiting, whisk the egg yolks with the remaining pre-measured sugar until lightened in color. When the dairy mixture reaches 175 degrees, whisk about half of it into the egg mixture, about a half cup at a time. Whisk the egg mixture back into the pot with the dairy mixture and heat on low until the mix reaches 180 degrees, stirring constantly (about 5 minutes). Do not boil. Strain the mix and stir to dissolve the salt. Chill the mix in an ice bath until about 45 degrees or cooler. Add the vanilla extract right before churning in an ice cream machine. Layer the ice cream with the spiced apples surrounded by caramel sauce, and sprinkle baked pie crust pieces throughout. Press a layer of wax paper onto the surface of the ice cream before storing in the freezer. For the spiced apples: Peel, core, quarter, and thinly slice the apples. Combine the sliced apples with the other ingredients in a medium size heavy saucepan. Cook the apples over medium heat, stirring often, until the apples are tender and all the liquid is gone. Chill the apples until needed for the ice cream. For the pie crust: Follow any pre-baking instructions on the package. The crust I used called for 10-15 minutes of thawing at room temperature, and preheating the oven to 375 degrees. Bake for about 10-12 minutes. Brush the crust with melted butter and sprinkle cinnamon sugar over the crust to taste. Bake for an additional 8-10 minutes. Let the crust cool and then break it up into bite size pieces for the ice cream.